Israel Communities Fair, a first of its kind, brings representatives from over 40 communities to help Olim find their dream neighborhood. Nearly 500 Olim (new immigrants) gathered in Jerusalem Monday night to hear about the most affordable and viable residential areas for newcomers to consider throughout Israel. Representatives from 40 communities from the center, north, south and within Jerusalem were there to inform them. Olim had the opportunity to explore various communities and hear from experts covering a wide range of topics concerning purchasing a home, understanding mortgages and choosing the right community for your specific needs. 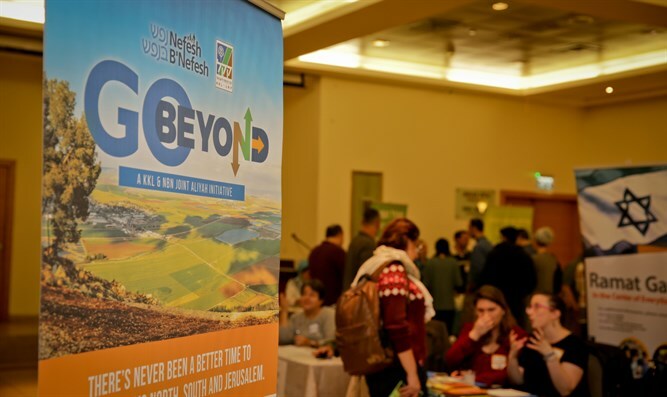 The event was part of the new Nefesh B’Nefesh and Keren Kayemeth LeIsrael ‘Go Beyond’ program, which works to develop the outlying areas of Israel and Jerusalem through Aliyah with a new set of special offers and benefits for Olim who decide to reside in these areas. “One of the main concerns for many new Olim is finding a suitable community with affordable housing. Through our first Communities Housing Fair, we had the opportunity to showcase the breadth and diversity of what the country has to offer, both in quality of life and accessible real-estate options,” said Rachel Berger, Director of Post-Aliyah, Nefesh B’Nefesh.